A couple months ago, Wolfram Alpha launched an impressive iPhone application based on their “computational knowledge engine” (a fancy word for search engine predicated on math) of the same name. Unfortunately, they horribly miscalcuted what it should cost when they set the price at $50. But rather than simply lowering the price, they’re trying another trick. As we pointed out at the time, one of the most humorous things about the app’s pricing is that the mobile version of Wolfram Alpha was completely free. Free beats $50 any day of the week, and I think WolframAlpha finally realized that as they have decided to destroy the mobile web version that was tailored for the iPhone and iPod touch, which TUAW noticed today. Now, when you point your iPhone’s browser to wolframalpha.com, you’ll be greeted by a pop-up letting you know that the WolframAlpha app is now available in the app store, complete with a link to go there and download it. You can also click the “X” to close this popup, but if you do, you’ll be greeted by a version of the site that is the same as the regular web site — which is to say, not at all tailored for a smaller mobile screen. It’s still usable of course, but it is much worse than the previously custom formatted version. 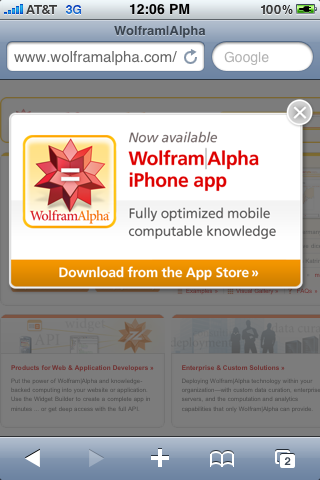 If you try to go to wolframalpha.com/iphone (the page where wolframalpha.com would redirect to if it detected mobile Safari), you’re greeted with a full page once again touting the iPhone app. What’s humorous about this page is that it’s also not at all tailored for the iPhone. Come on guys, you could have at least made the page that is trying to sell the iPhone app to iPhone users look nice on the device. Despite Apple featuring the app in the App Store, indications are that it’s simply not selling like hotcakes. One indicator: There are only 30 reviews for the app so far. Many popular apps have thousands of reviews. And many of WolframAlpha’s reviews are simply bitching about the price. Another indicator: The app is nowhere to be found in the top 100 grossing apps, the area Apple made in the App Store specifically to help showcase more expensive apps. If a $50 app is not among the highest grossing, that’s not a good sign for its sales. The bottom line: The app is still too expensive. And nuking the iPhone-optimized version is not going to change that. If you do happen to have $50 just burning a hole in your pocket, you can find the app here.